EXE Corporation acquires real properties mainly in urban areas and revitalizes them by matching their function to the needs of the locality. EXE maximizes the return on investment by dealing with all aspects including acquisition, renovation, leasing, property management and sales. EXE Corporation owns residential, commercial, office and parking buildings, and other property mainly in urban areas from which we generate stable revenue by maintaining high occupancy rates. 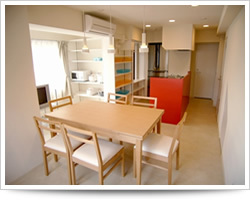 We put great effort into managing efficiently-designed shared houses which used to be dilapidated / old properties that we renovated, thereby providing a new lifestyle choice to individuals from within Japan and overseas. EXE Corporation has started buying commercial mortgage-backed securities and making M&A. EXE is very sensitive to changes in the market, and is actively involved in new investment which unites the real estate and finance businesses. EXE Corporation also focuses on unique investments such as education, art and services for the wealthy, in addition to real estate investment. We tailor individual services for each requirement based on clients’ needs after carefully interviewing them.